Another convention has come and gone and that means more con sketches! Here are two commissions I did recently at the 2010 Baltimore Comic-Con. The first one was for a “Firefly”-themed sketchbook. I find certain characters, like Mal, Zoe, and Jayne, to be a little easier to cartoonify since they have such distinctive features. Kaylee was a much tougher one for me. 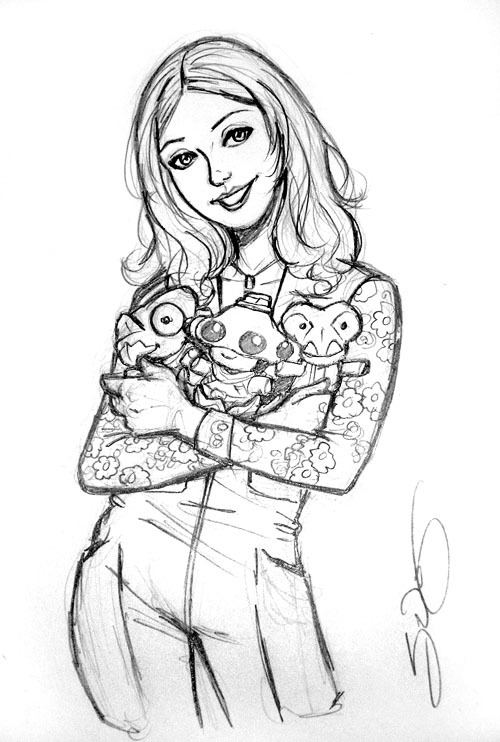 But I really wanted to draw a character holding some RUNNERS stuffed animals, and Kaylee seemed like the right one to do it. Later in the show, I was talking to David Petersen (Mouse Guard) and telling him about the sketch, and he quickly mentioned that it would have been funny to have drawn Jayne with the stuffed animals. And dammit, I think he’s right. The second sketch was for a DC Comics-themed sketchbook. I basically grew up on Marvel, so to be honest, I’m not all that familiar with the DC universe, but I’m a sucker for the Batman villains. For some reason, I’ve always really liked the Ventriloquist. Something about a nebbish guy who shouldn’t be intimidating but has a psychosis and alter ego that controls him. And that alter ego being a puppet. Because if I were crazy, I would totally act out through a puppet. 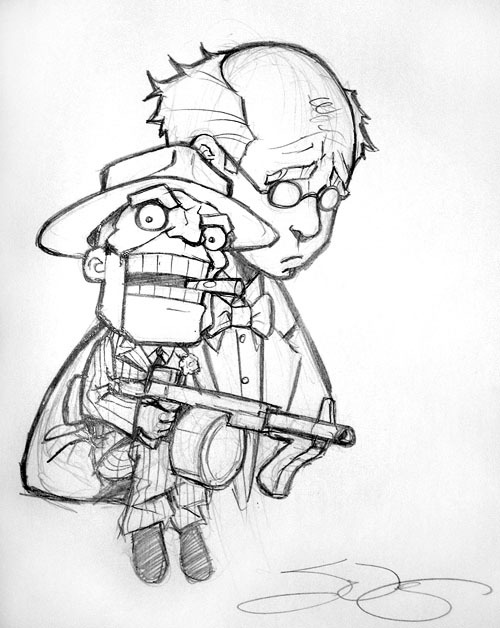 Anyway, after seeing this sketch, another attendee asked for The Ventriloquist as well for a sketch card to add to his collection. So I guess other people like The Ventriloquist as well.